It’s loud. Did I mention it’s LOUD? Very loud. 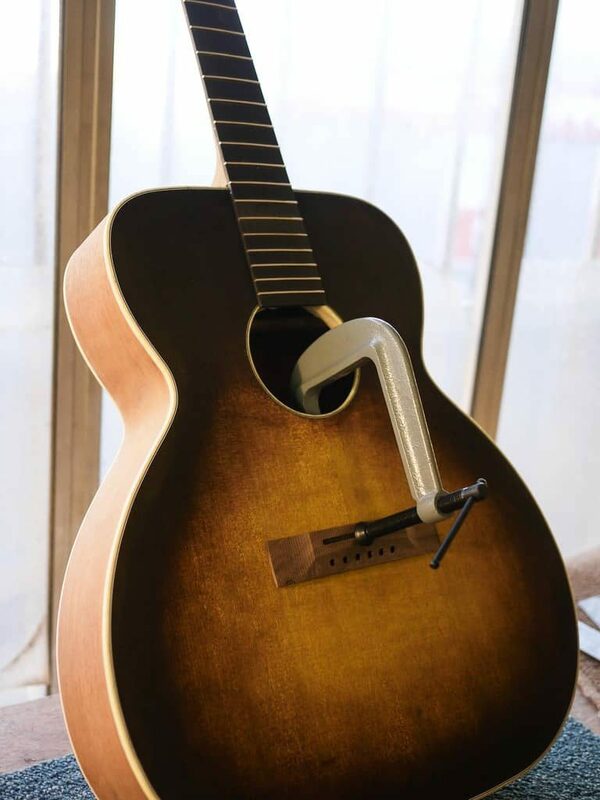 There is a forum called the AGF, and if you’re a follower of it you may have been watching a “build thread” featuring one of my Session King guitars. Well, the thread has been written by a chap in the UK who ordered a guitar from me. In fact, the first time he ever bought a handmade guitar was from me back when I worked for Sobell – he bought a Model O that I’d made. Anyway, here he is all these years later, back for another. In the meantime he’s owned a lot of fancy guitars, so it’s interesting that he fancied getting something more basic. So the bottom line was that while I knew it would be a good guitar, at that price I wasn’t expecting to be blown-away; well I am. The sound of this thing is unexpectedly enthralling. It’s loud. Did I mention it’s LOUD? Very loud. The trebles in particular are far louder than any other steel string I’ve come across. That includes Sobells. They also sustainnnnnnn. Indeed these two characteristics – sustain and volume – are the first two sonic characteristics to hit you in the ears vs. other guitars. It’s a very “dry” sound as well. Much more like an old Martin than a modern USA fingerstyle instrument. 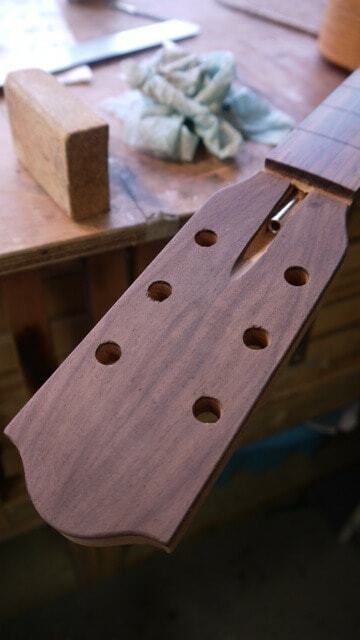 The basses in particular are dry and very defined. It’s a very “earthy” organic sound and is more “wood” than “string”. In these respects it shares many of the sonic characteristics of Nigel’s “normal” guitars and those from Stefan Sobell – there’s a lot of separation and clarity, and the bottom end is a little light versus the singing trebles. I’ve had guitars from both Sobell and Forster and this is right at the top of that pile, which I find astonishing given that it’s a fraction of the price. In many respects it’s also quite unlike any other steel-string guitar I’ve played, but shares common DNA with some nylon guitars, especially in the way it feels under the fingers. That’s to do with the sustain and the note envelope/decay. This is also an extremely innovative guitar. It’s heavy for a reason and I’m not about to divulge Nigel’s “secrets” online but it’s immediately apparent on close inspection that this guitar is stuffed full of ideas that go a long way to explain why it sounds the way it does. Nigel has a bit of a reputation for never standing still for more than a minute; he’s constantly seeking ways to move his art forward and nowhere is it more apparent than in this guitar. Did I mention it looks as cool as ****? The sunburst is lovely and the “relicing” really gives it an old Gibson vibe. I dinged it the other day and guess what? – I couldn’t care less. In contrast, I dinged my Woodfield classical a few months back and felt suicidal. With the Session King I think Nigel has achieved 3 things, any one of which would be something to be pretty proud of, but all 3 in one guitar: wow! 1. It sounds great, really great. Plays great as well. Feels great. 2. It looks way too cool for school. 3. It is really well-priced. In the UK this is less than a Collings/Lowden etc. Game over man. I am thrilled I ordered it. It has far exceeded any expectations I had for it. I wonder if he’d make me a small one…? Anyways, I hope you can hear what I’m talking about in this clip. I had intended to accompany this post with a video but I find my Flip Mino HD isn’t recording more than a few seconds, so time to buy a new camera. It’s a traditional pibroch bagpipe tune arranged by the inimitable and fabulously talented Richard Thompson and can be found on the studio version of The Dimming of The Day. Like him, I tuned this CGCFAD (i.e, DADGBE down a step). I played it unlike him tho’ but try and ignore that and listen to the guitar. Let’s hear from others who have ordered these. I hope you’re as thrilled as I am.